Replenish your dry skin. Our moisturising shea butter products are enriched with just the essential ingredients, leaving skin feeling supple, soft and radiant. Made with sustainable shea butter harvested with fair trade principles, our collection is formulated with future generations in mind. With Vitamins A, E and F, and a mix of botanical oils, our shea butter products will be your new go-to, everyday solution for personal care. Formulated with sustainable shea butter that's harvested with fair trade principles, each product is made with just the essential ingredients. Conditions skin, restoring radiance and helping protect the moisture barrier. Replenishes skin’s moisture, helping soften and soothe. Deeply conditons skin, helping relieve dryness. Replenishes skin’s moisture, helping soften and soothe skin. An essential addition to your everyday, go to collection. Our hydrating formula moisturises to help nourish lips and leaves them feeling soft and smooth. Containing five botanical oils, this silky balm is the perfect solution to dry lips. Moisturises, softens and soothes. Our hand cream is formulated to help provide long lasting nourishment by replenishing moisture, and is gentle enough for dry skin. Our non greasy formula is fast absorbing and leaves skin feeling silky and soft. Clean the right way. Our daily hand wash works to seal in hydration rather than stripping it from hands, leaving your skin looking supple and smooth. Vitamin E conditions skin while providing gentle radiance. Enriching moisture at your fingertips. Essential for replenishing hydration back into your hands. Infused with rose geranium extract and sunflower seed oil, this nourishing formula glides on hands easily for a smooth finish with no greasy residue. Treat yourself daily with this family friendly formula. A gentle and luxurious wash for that clean, smooth, and supple feeling of plush hydrated skin. Infused with Tahitian coconut milk oil, this creamy formula will leave you feeling fresh and hydrated. Light on the skin, heavy on the moisture. This nongreasy, easily spreadable lotion provides quick nourishment for the body. Our formula contains Tahitian coconut milk oil to replenish skin's moisture and help soften and soothe. Hand Care Duo Includes Hand Lotion and Hand Wash. Paired in a sleek, water resistant bamboo holder for your counter area or sink. The concentration of fatty acids in shea butter makes it especially moisturising for skin. It is often used to soothe and hydrate dry skin as well as help seal in the skin’s natural oils. The cinnamic acid and other natural properties in shea butter make it soothing for the skin. Shea butter contains oleic, stearic, palmitic and linolenic acids, helping lock in moisture and assists with preventing drying. 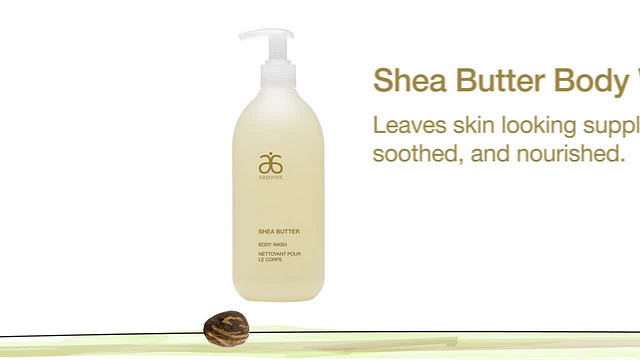 What’s the difference between our Shea Butter Hand Lotion and Body Lotion? Our daily Hand Wash works hard to clean your hands while sealing in hydration rather than stripping it away. Keeping your hands moisturised is a tough job. Our Hand Lotion is infused with rose geranium extract and sunflower seed oil to nourish hands. Our daily Body Wash is a family friendly formula that gently and luxuriously cleans while leaving you feeling hydrated. Our Body Lotion contains Tahitian coconut milk oil to replenish skin’s moisture and help soften and soothe. Its gentle and easy to apply all over. We use sustainable, fair trade shea butter. Shea butter is harvested from the seeds of the nut from the shea or karite tree; naturally rich in vitamins A, E and F, it provides skin with the essential fatty acids and nutrients necessary to support hydration. Shea Butter has been used in many countries for years to improve the appearance of skin and hair. Going back to Cleopatra’s Egypt, there are stories of people using the moisturising benefits of shea butter for cosmetic use to protect their hair and dry skin caused by the sun and winds of Africa. The shea nut used in Arbonne products is harvested in West Africa by a woman’s cooperative, from a wild growing tree protected by law in the sub Saharan belt. The trees begin to give fruit after 15–20 years of growth. No fertilisers or pesticides are used in the process, and the trees are pollinated by bees. The seasonal collecting period, boiling, and processing of the nuts occurs early in the morning by the local women. Most of the processed shea is exported, creating a valuable income for the families as well as the local economy. Sustainable product harvests set out to protect the land, improve the farmers’ or harvesters’ quality of life, and enhance the communities in which the crops are raised. To further this, fair trade helps to ensure that fair prices are paid to the local farmers who have raised the crops — helping support the local economy. The shea butter used in our products is harvested by local women, and helps empower the community, creates social interaction, protects the environment, and advances the local culture. Q. What is Shea Butter? A. Shea Butter is the rich, moisturising butter cultivated from the seeds of the fruit for the Shea (Karite) Tree. This butter is known for its high levels of fatty acids, vitamin A & E and has been used throughout Africa for centuries to promote hair and skin health. Q. What 5 oils are in the Lip Balm? A. Shea Oil, Sunflower Seed Oil, Argan Oil, Olive Fruit Oil, and Jojoba Seed Oil. Q. Can the Lip Balm be used with lipstick, lip gloss, or the lip treatment? Q. Where is the Shea Butter sourced from? A. We source our sustainable Shea Butter from a woman’s cooperative located in West Africa. Q. Are there any artificial flavors in the lip balm? Q. Is there any SPF in the lip balm? Q. Are there any natural oils in the Hand Cream? Q. What Key ingredients are in the Hand Cream? Q. How often should I use my Hand Cream and Lip Balm ? Q. Should I use Shea products if I have a nut allergy? Q. Are there samples of the Hand Cream? A. Yes, there are samples available through business aids.